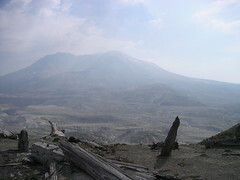 It often isn't this hazy, but there were fairly high winds in the valley that blew ash around like crazy. We are in the middle of the blast zone looking down the muzzle of the crater, as it were. It was still very desolate after 25+ years of regrowth.